If Netflix is the poster child for streaming video — with a following of 20 million and counting — then Hulu is the forgotten variety. In only its third year, Hulu is becoming quite the player and is holding ground in its mission to keep Netflix from taking over the (internet video) world. In fact, its business model might even be more stable: ad-supported streaming of videos and TV shows. It’s a model that’s worked for media companies since, well, the dawn of media. From newspaper and magazine, to radio, to TV and now online. Hulu’s CEO Jason Kilar projects revenue will double in 2011 to more than $500 million for all things Hulu: Hulu.com and Hulu Plus. Up from $240 million in 2010 and $108 million in 2009. Netflix clocked in at $2.16 billion in revenue in 2010 according to Netflix Q4 2010 financial statements. Up from $1.67 billion in revenue in 2009. And Netflix opts for ad-free content, for now at least. They’ve flip-flopped before. Hulu is on pace to hit 1 million subscribers in 2011 according to CEO Jason Kilar. A quick calculation will show you how big of a role advertising revenue plays in Hulu’s structure. And how important it will be in its future. In addition, according to Brian Stelter of The New York Times, content providers receive some 50 to 70 percent of advertising revenue. In a similar fashion to pay TV; though from what I understand Hulu offers a higher percentage to its content providers. As for Netflix, the company has yet to incorporate advertising on any level. Correction: Netflix has advertising on the inside flap of its DVD-by-mail sleeve. In late January of this year, the nation’s largest cable TV company, Comcast, purchased NBC Universal from GE, which included stake in Hulu. Hulu is now jointly owned by Comcast ‘s NBC Universal, The Walt Disney Co., News Corp. and global private equity investment first Providence Equity Partners. In the sale of NBC Universal to Comcast, GE had to relinquish its decision-making power and 32% stake of Hulu. The NBC Universal-to-Comcast deal gave Comcast 51% control of NBC Universal, now labeled NBCUniversal (no space and no peacock). Previously, GE owned 80 percent. Prior to the sale, GE purchased the remaining 20 percent stake from Vivendi Universal. GE’s stake in NBCUniversal is now 49 percent, though according to USA Today the company plans to completely remove its shares over the next eight years. The Justice Department and Federal Communications Commission included provisions in the deal that prevent Comcast from blocking NBC programming to other providers. As part of the deal, Comcast agreed to let NBC programming air on its rivals networks including Netflix. Now that we got that legal jargon out of the way, let’s take a look at the content. Free on hulu.com with advertising in each episode. The Hulu Plus option offers an expanded library and brings it directly to your TV via a high-speed Internet connection. Hulu, free for all on hulu.com, has more than 200 content providers including NBC, ABC, FOX, PBS, USA Network, Bravo, Fuel TV, FX, NFL Network, Speed, the Big Ten Network, Syfy, Style, Sundance, E!, G4, Versus, A&E, Oxygen and other online networks. TV programming, some of which the day after it airs on pay TV. Previous seasons/episodes, webisodes and current programming including ABC News, ABC 20/20, Good Morning America, 30 Rock, American Dad, The Biggest Loser, Big Ten Icons, Big Ten Greatest Games, Bones, Bob’s Burgers, The Celebrity Apprentice, Celebrity Rehab, Chuck, Colbert Report, Community, The Daily Show, Family Guy, Fora.tv, Fox News, Glee, Greek, House, How to Look Good Naked, Imus in the Morning, It’s Always Sunny in Philadelphia, Jersey Shore, Kitchen Nightmares, Law & Order, Lie to Me, Lost, Master Chef, NFL Films Presents, Nightline from ABC, NOVA, Parks and Recreation, Project Runway, Rescue Me, Saturday Night Live, Super Nanny, Top Chef, Tosh.0, Wired Science…and a ton more. Those are just a few that caught my eye. The list was far too big to count. Why not take a look for yourself: Hulu.com browse TV. Again, current seasons, some of which are available the day after they air on TV. And this is the free version, which is only available on your computer. But if you want to go through the trouble, you could hook up your PC to your TV using an HDMI cable (OK?). Or if you’ve got an older set, Google “computer to tv cable” and you’ll see other options like s-video cables or VGA. HDMI offers the highest quality and is the easiest to use if your computer and TV have the capability. Some episodes on hulu.com are only available for a short period of time. And the free hulu.com content doesn’t offer as much of the previous-season library of Netflix. But Hulu Plus comes a little closer, offering TV content sometimes from the first episode of season one to the most-recently aired episode in the current season. Hulu Plus – for $7.99 per month – brings a lot to the table. Though Hulu Plus can stand on its own, it makes a perfect companion to Netflix and its breadth of on-demand content. The same great content from Hulu.com, but a lot more including previous seasons and episodes as well as movies. Hulu Plus also connects it all to your TV, making it available with the click of a button (Once you’ve got everything set up, which is easy enough. All you’ll need is a Hulu-compatible device like a Blu-ray player, video-game system or other box. And a subscription to Hulu Plus for $7.99 per month. For a guide of compatible devices, click here. It’s a pdf.). According to Hulu, its Plus offering provides access to more than 16,000 episodes from more than 400 current and classic shows. As well as the recent exclusive content from the Criterion Collection. The biggest advantage of Hulu Plus over its competition (Netflix included) continues to be current episodes a day after they air. Current Content. A position Netflix had seemingly surrendered to Hulu until last week, when it announced that it’s buying the rights to “House of Cards,” a series starring Kevin Spacey. The show premieres late next year and will be available exclusively on Netflix for at least two seasons. This is big news for Netflix and Internet TV as a whole. It also goes against the company’s public stance only two months ago. Here’s a clip from a message to its shareholders on Jan. 26, 2011. “Our primary strategy is to offer complete previous seasons of shows rather than offering those shows the day of, or a few days after, broadcast, during the critical ratings and revenue window. This is in the best interest of content owners and is consistent with our desire to offer a very low-cost service for consumers.” -Netflix in a message to shareholders Jan. 26, 2011. More on Netflix and “House of Cards” in a future post. 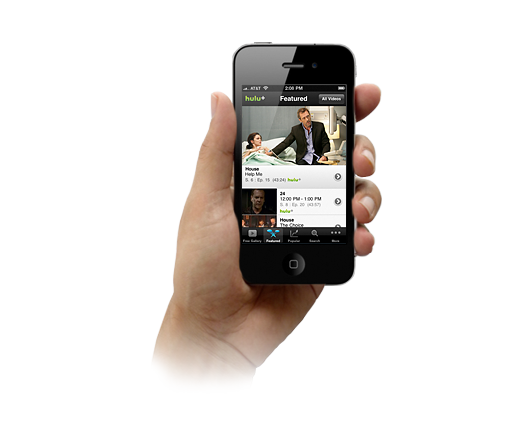 Hulu plus is also available on mobile devices including iPhone, iPad, iPod Touch. Hulu says “many more devices coming soon.” Android smartphones and are next according to the website. Though it has a long way to go to catch up to Netflix, for the future of streaming video — and all the cable cutters out there — the competition Hulu offers Big Red will benefit the industry, not hold it back. Images courtesy of casualgadget.net, intomobile.com, obsessable.com, blastmagazine.com. Netflix is changing the way we think about television: What we watch. When we watch it. And, most importantly, how we watch it. Its movie-suggestion service makes Netflix more than a streaming-video company; it makes it your streaming-video company, fine-tuned to your tastes. This post concerns Netflix and how it is re-defining television — based on my experiences with the video-streaming and video-rental service for the last ten months, during which time I’ve been without any cable subscription. With more than 20 million subscribers and counting, as of January, 2011, Netflix is becoming quite a player in the video-on-demand world. In fact, according to the company, it’s the world’s leading Internet subscription service. 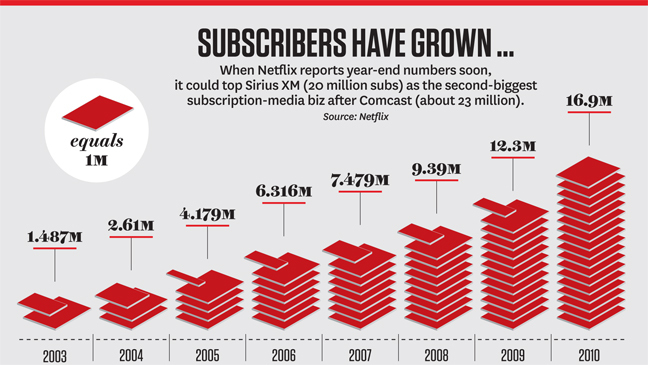 From 2009 to 2010, Netflix increased its subscription base by more than 4.5 million. At that pace, in 2011, Netflix will easily become the nation’s leading video service offline as well. Comcast is currently the nation’s largest at 22.8 million subscribers. As far as content is concerned, Netflix is hard to beat. Starz alone supplies about 2,500 pieces, split evenly between movies and TV titles. That’s nearly identical to content offerings from Starz to Comcast and DirecTV, per Hollywood Reporter. Other major content providers for Netflix include Time Warner, Fox, Epix, Relativity and NBC Universal. What started as a DVD-by-mail service has transformed into a streaming super-power. Streaming content for Netflix is an estimated 20,000 titles (and counting). And it’s all available to watch instantly on your TV, laptop, PC or mobile device. Oh, and they’ve got around 100,000 titles on DVD, available by-mail in about two days. All you’ve got to do is pick a plan, starting at $7.99 per month with streaming. Users can change or cancel their subscription at any time. No early cancelation fees here. Blu-ray Option: Netflix subscribers have access to some 1,000 Blu-ray titles for an additional $3 per month, on any plan including DVDs by mail. Netflix offers other plans, up to eight DVDs at-a-time for $55.99 per month. I’m on plan 3, Unlimited Streaming and two DVDs by mail at-a-time for $14.99 per month. My wife and I each select one DVD at a time and we can watch Netflix Streaming whenever we want on any TV in our house (thanks to Playstation 3, Wii and our Sony Blu-ray player, which are all connected to Netflix) or online. When we’re done with one DVD, we send it back in the mail, with the provided and prepaid red envelope. The next title in our online queue arrives in about two or three days. In plans 2 through 5 above (my numbering system, not from Netflix), users can rent as many DVDs by mail per month as there free time can allow. There is no maximum number of titles per month, as there is in option 6, with a max of two DVDs per month for $4.99/mo. My DVD queue, showing what 2 DVDs I currently have ‘out’, and then the next in line. From a library of 100,000+. Titles can be shifted up or down and new titles can be added at any time. Maybe the best part of Netflix, after the content of course, is its Suggestions for You. Welcome to Movie Suggestions from Netflix. Similar to Pandora’s music selection, Netflix suggests movies you’ll like based on your ratings and ratings from others who have similar tastes in movies, as well as information from your Taste Preferences. Users can rate movies they’ve seen in and out of Netflix. 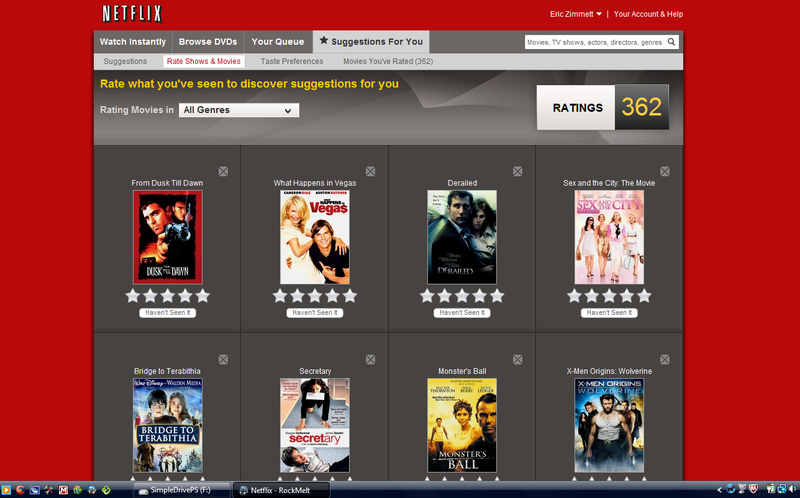 Users are able to view movies, and then rate them on netflix.com, in the following categories: all genres or in 14 genres individually. They are: Action & Adventure; Animation; Anime; Children & Family; Comedies; Documentaries; Dramas; Foreign; Horror; Independent; Musicals; Sci-Fi & Fantasy; TV Shows; and Thrillers. Users rate movies on a scale of one to five stars. TV Shows and Movies that I can rate on a scale of one to five (stars). At the time of this screenshot, I had rated 362 titles. Now I’ve scored more than 500 titles. I’ve rated some 530 movies & TV shows to this point. I’ve also noticed, the more movies I rate, the closer the suggestions are getting to my actual tastes. 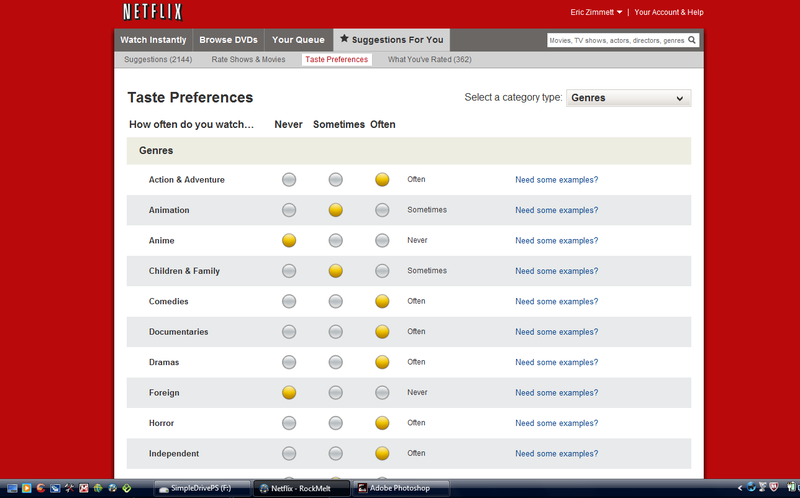 Netflix has 13 Taste Preferences that users can fill out to let Netflix know what types of movies they like. Basically, 13 preference categories. They are, specifically: moods, genres, qualities, storylines, release date (decades), sub genres, languages, children’s age, sports & fitness, music, story source, cultures and special interest. Each preference category contains around 40 questions. That’s more than 500 ways to detect your taste in movies and TV. Which leads me to believe Netflix knows me better than my wife. This screenshot displays Taste Preferences, one of 13 different preference categories. Each category contains around 40 questions. That’s more than 500 ways to detect your taste in movies and TV. On the Netflix.com dashboard, under the “Suggestions for You” tab, lies “Taste Preferences.” This questionnaire allows users decide how often they watch movies of that particular genre: 1) Never; 2) Sometimes or 3) Often. Above I’ve displayed my rankings for the Genre category. 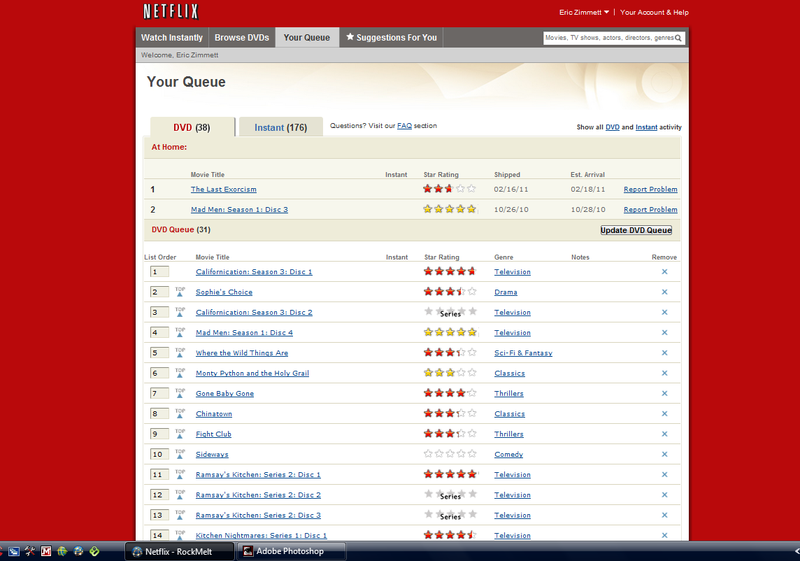 Netflix uses this information (Movie Ratings and Taste Preferences) to fine-tune its movie and TV suggestions. I’ve notice the more titles I rate, the better it gets at determining what I’ll like. I watched The Social Network yesterday. It was my second time watching the Facebook-inspired biopic. It’s a great flick, however true-to-life it was. The film is bringing even wider publicity to the social networking site — originally called The Facebook as the movie accurately depicts — and CEO Mark Zuckerberg. It’s a communication vehicle, a networking resource, and so much more. In the movie, after Facebook had taken over at Harvard University, they make reference to the term “facebook me.” I guess it’s today’s version of, um, “look me up in the phone book.” But it’s definitely a sign of universal adoption, similar to Google’s climb to the top. “Google it.” Or Photoshop, which has become synonymous with photo editing. Becoming a verb is the ultimate goal for a company. Users, all 500 million of them around the world, are spending more and more time on Facebook. At work, at home and on the go via smartphones. Even the term “on facebook” does not refer to http://www.facebook.com anymore with the adoption of Facebook application for smartphones and the new Facebook phone itself. Mobile is taking over my life. I’m on my Droid all day. And night. I’ll often be surfing the web on my Droid with my laptop right next to me. I use Facebook on my smartphone almost as much as I am on my laptop and my work PC. I wrote some of this blog post on my Droid. Yep, with my recently installed WordPress app. In fact I’m writing this sentence on it. I’ve read more news on my Droid (my first smartphone) in the last six months than probably the previous six years with access to newspaper and TV. Smartphone news apps like New York Times, USA Today, CNET News, Engadget, NPR News, CBS News, Yahoo! News, The Huffington Post and many more. Text-based and videos. In some cases, the same news videos that air on TV. The world is becoming increasingly mobile. And the brands and companies that move with that shift will prosper. While those that don’t will have to play catch-up. Smartphone users are on the rise, 60 percent higher at the end of 2010 than it was a year ago. Smartphoners are ready to eclipse the number of feature phone (dumbphone) users. That should occur sometime in 2011. In the three-month period between September of 2010 and December of 2010, nearly 25% of mobile subscribers accessed a social networking site. Rockmelt web browser. 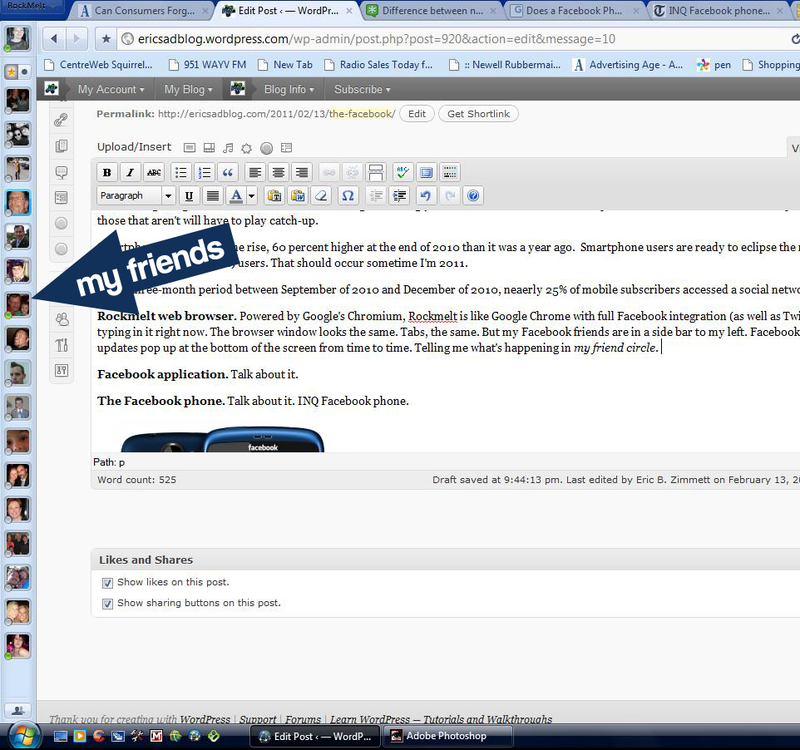 Powered by Google’s Chromium, Rockmelt is like Google Chrome with full Facebook integration (as well as Twitter). I’m typing in it right now. The browser window looks the same. Tabs, the same. But my Facebook friends are in a side bar to my left. Facebook status updates pop up at the bottom of the screen from time to time, telling me what’s happening in my friend circle. I can chat with my friends without opening a new tab, or without going to Facebook.com. I just click on a friend’s name in the left panel and the chat bar slides open. Below is a screenshot I took while composing this post. You can see my friends on the left panel. 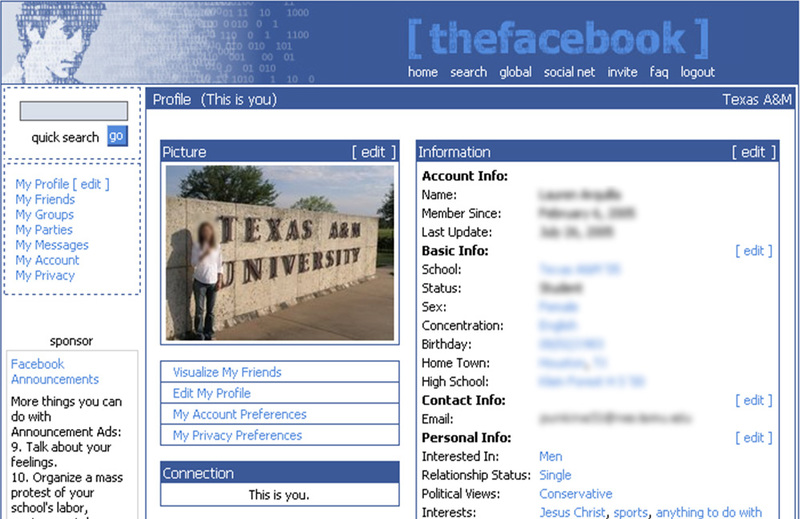 Facebook application. The Facebook application on smartphones is a quicker, slimmer version of facebook.com. It launches faster than opening a browser on your smartphone and is basically a mobile version of the website. You can navigate all of Facebook’s features on the application, like the News Feed, your Profile, your Friends, Messages, Places, the new Groups feature, Events, Photos and Facebook Chat. Facebook chat on your mobile phone is a nice feature, essentially a free texting service. And an untitled photo stream, similar to the news feed but with only photos uploaded by your friends. And then there’s Facebook’s new messaging service. The Facebook phone. Facebook itself is not building a phone, that we know of. But other manufacturers are building phones that integrate the social networking site into its phone (similar to Rockmelt’s inclusion in its web browser). One Facebook phone manufacturer is INQ (pronounced “ink”). The company has actually introduced two versions of its Facebook phone, the Cloud Touch and the Cloud Q.
HTC (pronounced, um, HTC) is also developing a Facebook phone, set to be introduced this month according to reports. The phone will have a dedicated Facebook Button that will take users directly to Facebook. “It’s one of HTC’s main pushes for this year,” a person familiar with HTC’s strategy told Financial Times. However the Facebook phones turn out, one thing is for sure: this is only the beginning. Facebook is integrating itself into every aspect of our lives. On the web, on our phones and on the go via status updates, photos, tagged friends and events. Facebook’s “Like” feature, as Zuckerberg likely envisioned, stretches all across the web, making Facebook the center of it all. And we all know it’s not over. Facebook is not done expanding, evolving and becoming even more entrenched in our personal and business lives. I, for one, welcome the intrusion. Tomorrow’s gadgets, games and mind-blowing media, introduced today at the world’s largest consumer electronics trade show, CES. The 2011 Consumer Electronics Show, CES, was held Jan. 6 through Jan. 9 at the Las Vegas Convention Center in Las Vegas, Nevada. Two trends to keep an eye on: 1) Music, particularly how we listen to radio at work, in the car and at home; 2) Television. I predict a big change in 2011 in the way we watch TV. We’ve already experienced the start of it with Netflix, Hulu, GoogleTV, Boxee Box, etc and devices like SlingBox, which slings your paid content to other sets and devices outside of your home. But I think this trend will explode in 2011 or early 2012. TV isn’t dead, it’s just evolving, and its audience is becoming fragmented. The Entune infotainment system incorporates navigation, media and entertainment into your dash via smartphone integration. Basically, it syncs applications from your smartphone (be it iPod, Droid or Blackberry) and displays the apps (like Pandora) on the dash. 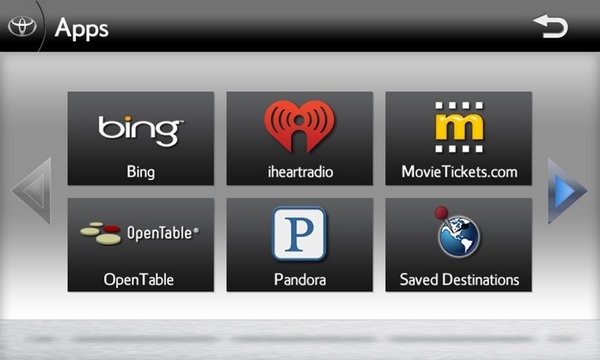 Including Bing search, MovieTickets.com, navigation, and music services like Pandora and iheartradio. Toyota has announced that some of these features are disabled while the vehicle is in motion (forcing you to fumble around on the tiny screen of your Blackberry instead, perhaps). Entune is due on “select models” sometime this year. Television doesn’t live in box anymore. Well, it still kind of does, but that box is hooked up to the Internet. Connecting our HDTV sets to the world wide web syncs our Televisions to an array of programming and applications. Programming like Netflix, Hulu Plus and Vudu as well as applications (apps) that vary depending on the manufacturer, product and model. Samsung’s apps include Facebook, Twitter, YouTube, Pandora, Blockbuster, ESPN, AP, USAToday, Yahoo!, Skype, and many more, all on your TV. And good for us, everyone’s getting in on the act. From Apple to Zenith. Tablets melt the Web, Books and TV into one mobile device that goes where you go. Motorola Xoom is the latest, which utilizes the Android operating system, and includes the the first dual-core processor. I’ve been without cable TV service since April of 2010. No DirecTV, No Dish, No Comcast, No nothing. But I’m watching more television shows and movies than ever before. With Netflix and Hulu Plus. With Netflix, $8.99 per month, I’m watching TV shows like The Office, Californication, Lie to Me, 30 Rock, Weeds, American Pickers, Family Guy and others. From the first episode of the season to the last. On my schedule. I also just picked up a subscription to Hulu Plus, an additional $7.99 per month. Netflix offers a much larger library and has nearly every title that Hulu Plus carries, but Hulu Plus lets me watch current seasons of shows like Glee, Saturday Night Live, The Soup, The Office, 30 Rock, House, Family Guy and Lie to Me. Again, these are just the shows I’m watching. With Netflix and Hulu Plus I’m watching more shows and movies than ever before. It’s more productive TV viewing. Instead of surfing channels, I pick exactly what I want to watch on my schedule. All of this makes me wonder. What is “TV”? Is it a service? Or is it the product, the show, the movie or even the network? Is today’s “TV” the distribution vehicle or the product delivered? I believe TV should be viewed as the product. But right now we’re paying for the distribution vehicle: the provider. Like Comcast, DirecTV, Dish, Windstream, etc. There’s a shift occurring. TV is changing from the provider to the product. The DirecTV vs. Dish battle has increased in intensity within the last few years. In the next five to 10 years it will become far less important which vehicle we use to get our content. Because these new services are taking advantage of what consumers already have: HD TVs, Internet-connected sets and high-speed wireless internet. And new services and boxes are popping up every week. 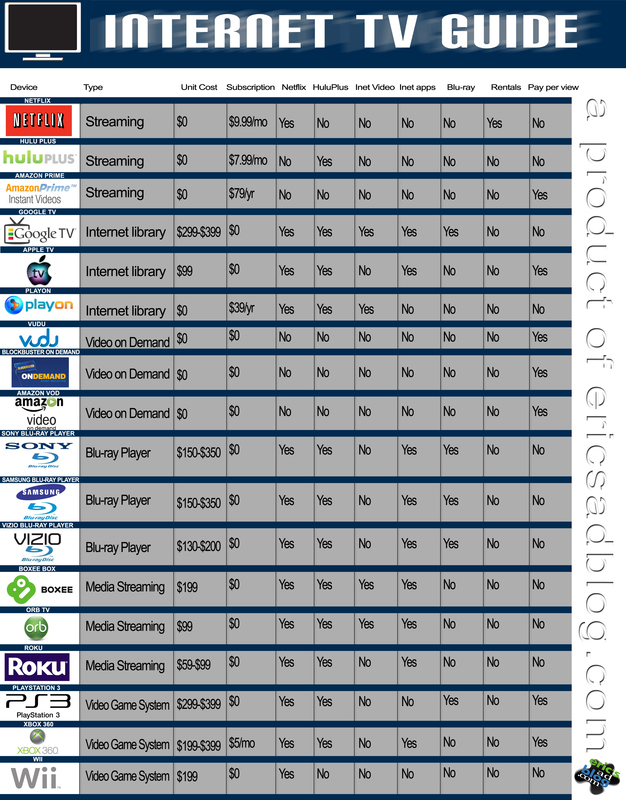 Hulu Plus, Google TV, Boxee Box, Orb TV and more. And the pricing is starting as low as $7.99 per month. That’s a win for consumers. What we’re witnessing is not the end of TV but its future. And I’m happy to be an early adopter.